Compared to most of the natural satellites of the solar system, Moon is a large body indeed. Scientists say that understanding the way in which Moon was formed and evolved (gradually changed over a period of time) helps us to understand the history of the solar system including that of our own Earth. Today, many scientists agree that Moon came into existence about four and a half billion years ago. They believe that a large Mars sized body came and hit the Earth at that time. 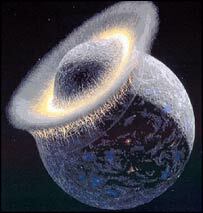 Because of that colossal collision, the Earth lost its outer portions. And, the colliding body was destroyed. Pieces generated by that gigantic collision started circling the Earth. Slowly, they came together and formed the Moon, say the astronomers. From time immemorial, humans have curiously gazed at the Moon's surface and wondered as to what was there. Many thought it was also a world where humans and animals lived. Ancients saw and imagined a rabbit, a human face or some other feature or creature in the Moon's disc. But, ancient Indian astronomer Aryabhata accurately wrote about many aspects of the Moon. Galileo Galilee was the first person to systematically observe the Moon through a telescope. When Galileo turned his crude telescope towards the Moon's disc in 1609 AD, he was surprised to see mountains and valleys as well as dark areas which he confused for large water bodies like oceans and seas. Other astronomers of that time also thought that there were large water bodies on the Moon. Hence the fanciful names like “ Sea of Tranquility ” and “Ocean of storms” on the Moon though liquid water is not found on the Moon in seas and oceans, as it does on Earth. Compared to Earth, moon is a much smaller world. Its diameter is about 3,476 km, which is about one fourth (1/4) of Earth. And the mass of the moon (meaning the quantity of matter which it contains) is only 1/81 of the mass of Earth. Because of the two reasons, the gravity on the surface of the moon is only 1/6 of that on Earth. That means, if you weigh 60 kg of Earth, you will weigh only 10 kg on the moon! So, you feel much lighter on the moon compared to Earth. You may think that Moon appears big because it is quite near to us. If so, you are correct indeed! Moon is the nearest heavenly body to us. The average distance between Earth and Moon is 3,84,000 km or nearly 400,000 km (four lakh km). This is very small compared to the distance between Earth and Sun (which is about 150 million km or 15 crore km) or the distance between Earth and the nearest planet to us, Venus (which is about 40 million km or 4 crore km). Though moon is a smaller world compared to Earth, it has many surface features with which we are familiar. They include mountains, valleys, plateaus and plains, rocks and soil. But, moon's surface is covered by millions of craters, which are rare on Earth. 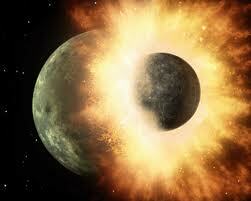 And, temperature on the surface of the Moon varies widely and can be as high as +130°C and as low as -180°C. Since Moon takes about 27.3 days to go round the Earth, length of ‘day time' on that world lasts for about a fortnight. So is the duration of night. And, one important thing about Moon; Unlike Earth, Moon does not have an atmosphere, and because of this reason, liquid water does not exist on the Moon in lakes, rivers, seas and oceans. So, you have to wear a special space suit and helmet and carry your own source of Oxygen to survive on the lunar surface. This is what Apollo astronauts who traveled to the Moon did. Indian space travelers might do the same one day in the future.